Post note: Thanks to anyone who made it to the show, what a fun night, perfect weather, great turnout, sold a few things, met some of you readers, saw old friends...exhausting, but wonderful. Showing with Lisa Kaser was a treat, everyone agreed our work meshed oddly and magically. 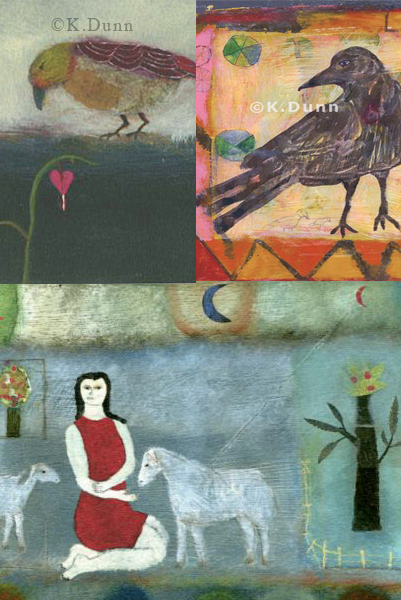 I posted posted all the pieces currently in the Guardino Gallery show in Portland. isit the Flickr site to see the pieces, sizes, prices. 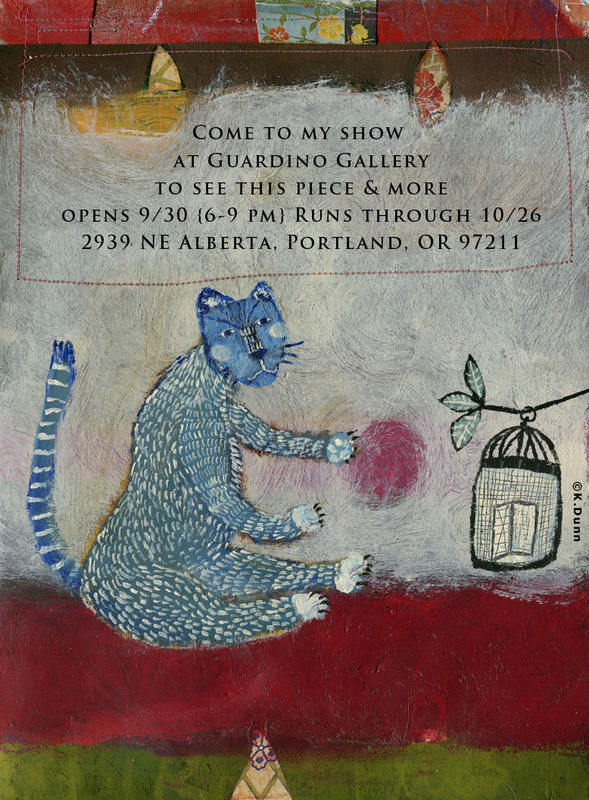 Guardino Gallery is located at 2939 NE Alberta, Portland, OR 503-281-9048. If you can't make it to the opening, or are out of the state, you can still purchase any piece through the gallery by calling them directly. You can purchase a piece now even before the opening. And if you are making it to the Thursday, September 30th opening, I will be there from 6-9pm along with the Dirt Farmer and hope to meet some of you. 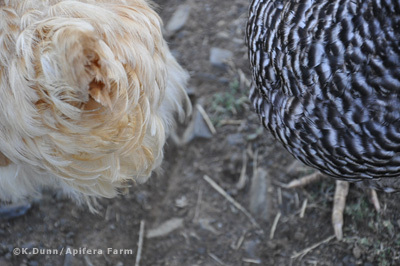 Sometimes it's hard to get the hens to stop and chat with me. They are purposeful, busy creatures. Somewhat comical to see a group of senior pygmies on their way to bed, especially from the rear view perspective. But what is so endearing is that each of these creatures is crippled [except Frankie, taking up the rear in this picture], yet they get up each day and fall into their simple little routine: greet me, I greet them, eat, bang heads with Frankie, eat more, find the fresh hay flake, lie in fresh hay flake and eat lying down. That's it. Their lives are contained now in one barnyard, in a consistent arrangement of events. The orange beasts arrive just in time to say "Hello", and "Good bye" to the yellow giants. They share the common trait of being spectacular, and odd. While they don't know each other personally, their parents were all kin, born of the same dirt with ancestral worms that traveled under them and birds that sat atop them. Warmth wanes. I always knew he was magical and had many stories to tell me. But what we discovered on Saturday in the old barn, three days after our old donkey's death, was clearly love letter from our dearly departed Giacomo.What a roller coaster of love this week has been. I didn't think I'd hear from Giacomo so soon after his death, I knew he had things to do in his new realm, things that didn't concern me or the earthly loves he left behind. 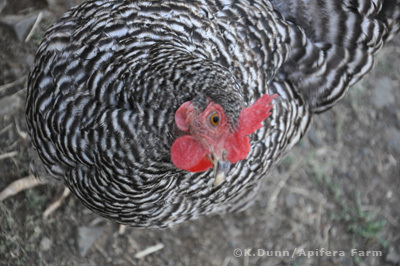 But before I can explain the magical occurrence of Saturday, I have to tell you about one of our chickens, Alice Waters. Alice is a very independent Aracauna who often goes off to roost on her eggs in top secret spots. Of all the hens, she is the cleverest hider of eggs. Now right around when dear old Giacomo was failing, and I was spending all my energy helping him, I remember noticing I hadn't seen Alice lately. Even when she hides her eggs, she usually comes out for breakfast. But I quickly forgot about it, I had Giacomo to care for. Saturday morning Martyn and I were working in the old barn near where Giacomo had spent his first, and last moments at Apifera. I looked out at his grave, and held Martyn and said, "Sad. "...But we quickly went on with our work. 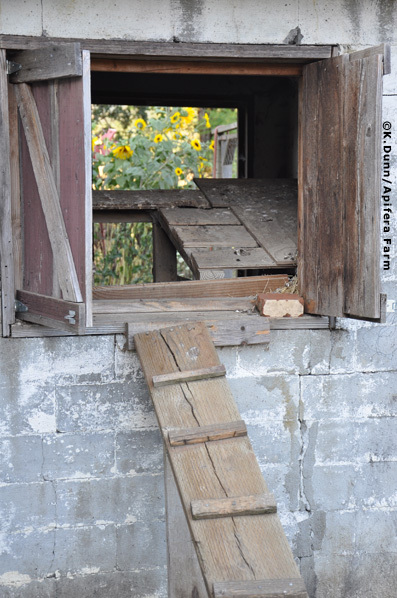 I noticed the tall ladder leaning on the upper hayloft, and it reminded me that Alice once hid eggs up there. Since I couldn't remember seeing Alice for a few days, I decided I better make a real effort to find her, either dead or alive. I crawled up to the loft, and peeked under the floor boards where she last hid her eggs, and sure enough, there was Alice. She didn't make a peep, but somebody else did. "Chicks!" I gasped. Martyn ran and got one of my rescue crates and we carefully pulled Alice out, and there was a young chick, and five others! As I helped mother and chicks to the safety of the "Chicken Training Area" of the hen house, I realized these chicks were no more than 2 or 3 days old. 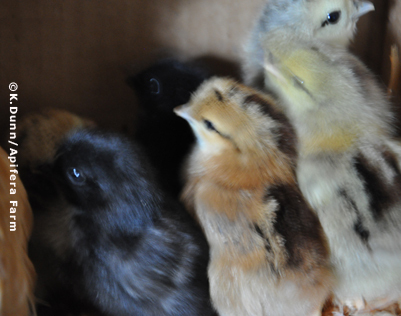 And of the six chicks, 3 were a beautiful black, just like our old donkey. "Giacomo..." I thought. If you don't believe in gifts in the form of magical coincidences, read no further. Dear Apifera, Thank you for your love, and I felt all your tears over my body. 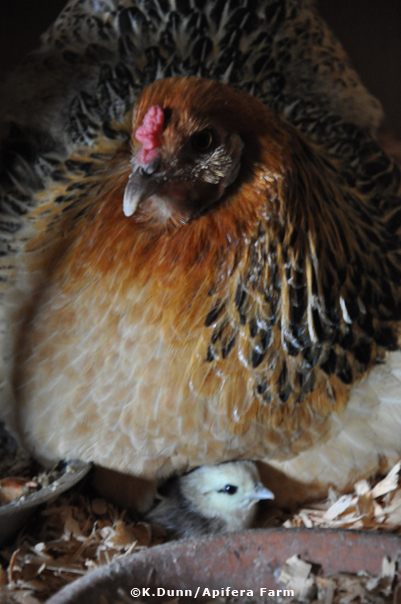 But remember to focus on the living, that need you, like these little chicks. Those rooster feathers you put in my top knot were magical indeed, just like you said they'd be. Love, Giacomo. The surprise of the new chicks lifted my spirits, and although I'm still amazed Giacomo is gone, he lives on in those darn little chickens. 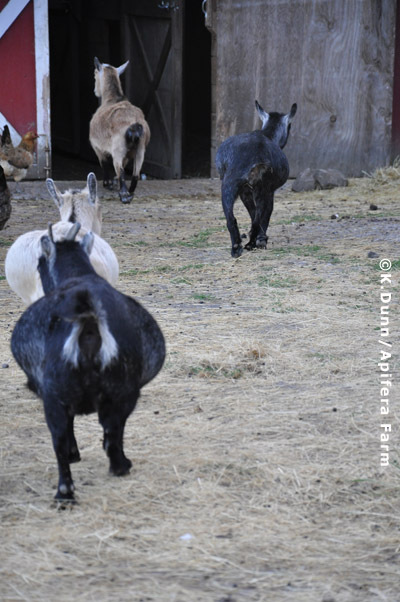 While adding roosters into an existing flock can create problems, I am convinced one of the black ones is a rooster and has a bit of Giacomo in it. I have no scientific or biological evidence to back up my theory. Nor have I consulted with a buddha, minister or clairvoyant. I don't need too. 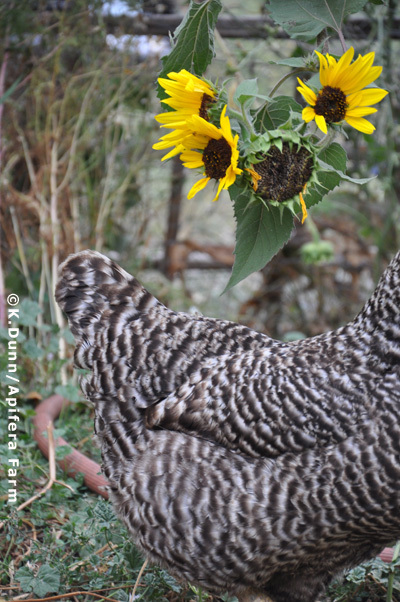 But as those chicks grow, I know I'll be naming one "Little Giacomo". 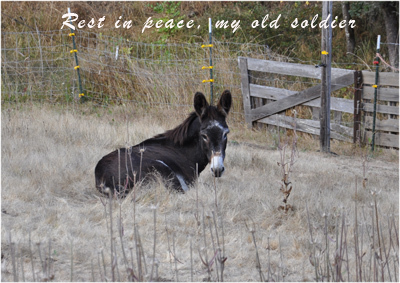 To all of you who bought prints to help bring this wonderful old donkey to our farm, take heart, his time here was short, but he felt the love. We laid Giacomo to rest today. We are shocked, although preparing a large animal for burial is sobering, and allows the living to slowly comprehend, "Oh, yes, he's gone on." He was only with us 19 days. But those 19 days encompassed an entire journey, not only for him, but for us as his final caretakers. 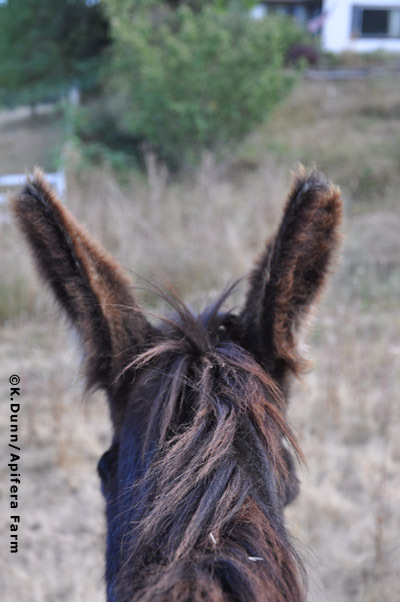 Having lived 20+ years in a variety of situations [we can only assume] , and having endured abuse in his final years, if not longer, my main goal was to give this donkey a true sense of home, the kind of home that is always there for you, no matter what weather blows in. The kind of home where a person comes out the door in the morning and sings your name, and you know, no matter what, you will be fed, and touched, and respected. No one will strap you to a post and leave you in heat without water, or rope your legs and flip you over like a fried egg. On his first day with us, I talked to him about my intentions. I told him, "You can stay here forever. I'm not going anywhere. You can die here." I solemnly believe old creatures, and old people, need to know they have a safe place to die. In the wild, they seek it out. 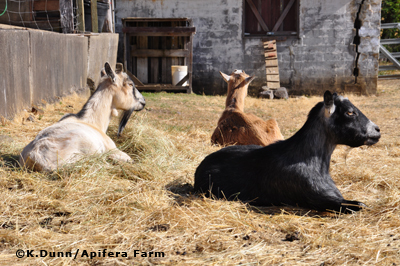 They might seek out a quiet place alone, but it might be in earshot of all the barn animals they've communed with over time. As usual, the universe and its wisdom was bigger than me- while I was busy imagining all the stories he would share with me, and walks I would take him on to show him the river and upper Apifera, he was winding down. He took my words to heart. I noticed something was wrong about a week ago, even on his first day. His sheath was swollen. Since the rescue had not done a blood panel on him before adopting him out and since he was old, I called my vet immediately and had him check up on some things. All seemed okay but certain things weren't functioning right for the old guy The next day, he had drops of blood in his urine. 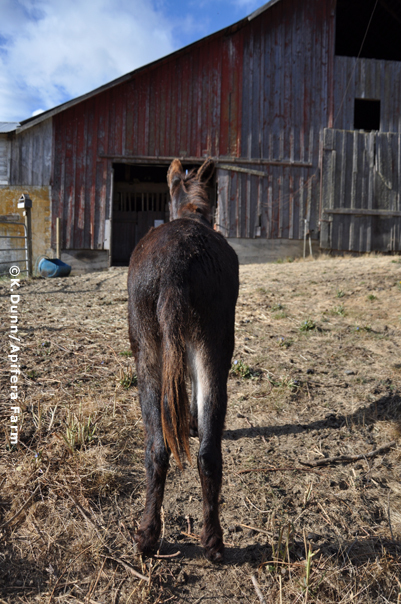 I had the vet out again, immediately, to do a test or whatever he suggested and on the day the vet came, I noticed even more blood in the old donkey's urine when I fed him. Not good. He had had plenty of hay and fresh water here, so the fact he was still eating and drinking well was a good thing. But looking back, we all agreed, that was just one miracle that was presented to us- for if I hadn't seen the urine, I'm not sure we would have immediately done the tests we did that day. And those tests showed us how truly ill Giacomo was and it was damage that had happened from years of neglect according to the vet. His kidneys were beyond help, with liver issues too. He was anemic, but with a non functioning kidney, treatment wasn't going to help. Within the short 12 hour period we waited for test results, I saw Giacomo in more and more pain. He had arrived very damaged. Just yesterday morning, it seems so long ago now, I went out to feed him, and I still didn't know the results of the tests, but I had slept with hope in my heart. When he first saw me, he tried to let out this bray, but it was more like a plea. I saw more blood, and I saw him stretching his neck, gritting his teeth and lifting his lips, a true equine sign of pain. He followed me around as I did chores, just like he always had. But he tripped once, and when we found the place on the grass he liked, he lay down, and put his head in my arms- another of his favorite positions. But he then laid back and I could tell, he was in such pain. I went to call the vet, hoping the tests were in, but also to tell him what was happening. Upon reaching the house, the vet had just called, and the news wasn't good. We acted swiftly to keep him from being in any more pain. My vet dropped everything to come out and help him on his way. 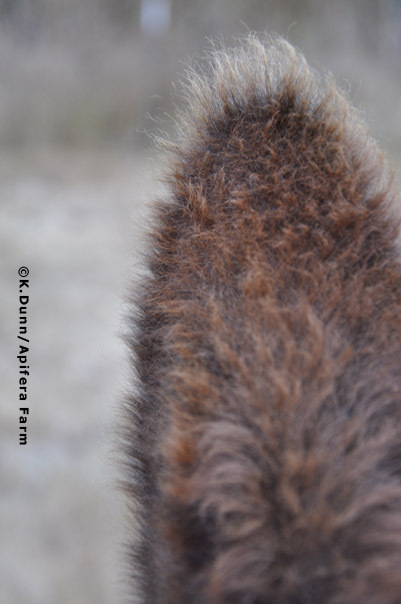 I walked him to the old barn, where his time at Apifera had started, just 19 days earlier. I had already said many good byes. Just an hour earlier, I told Giacamo how the night before I had been working on a little painting of an apple tree, and had been wondering how to finish it. 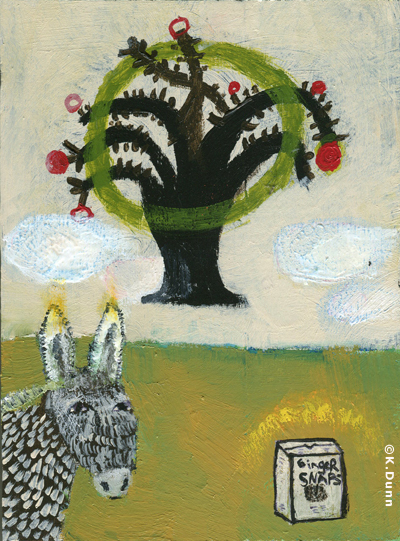 The apple tree looked like it floated, so I put clouds around it, and then I thought, "This is like donkey heaven," so I added an old donkey. I told Giacomo, "When you see that tree, you'll be home." I placed a rooster feather in his top notch. He's buried with tokens to help his journey forward: rooster feathers to help him fly better to his apple tree, a small piece of my art of a woman and a donkey, a ring to show my commitment to him, some chicory flowers, and of course, his favorite, ginger snaps. We had a private burial, with the donkeys and Stella and Iris. 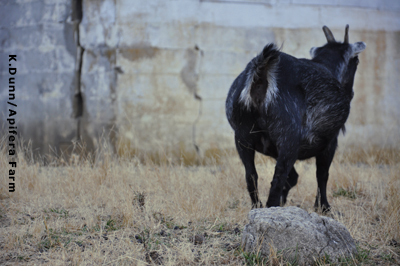 Perhaps one of the most endearing things was watching the donkeys jump in the newly dug empty grave, and standing there, at attention. They climbed out, and watched the entire procedure, ears forward, not a peep or movement out of them. I returned to the old barn to watch and watched while the earth was returned over our old soldier. And then Pino came and stood with me, until it was over. Why did it happen this way? Oh, there were reasons. Some we'll never know. But there were reasons, and I was honored to be part of his final days on earth. I read in a hospice book once that, it's important to tell the dying, 'It's okay to go now". 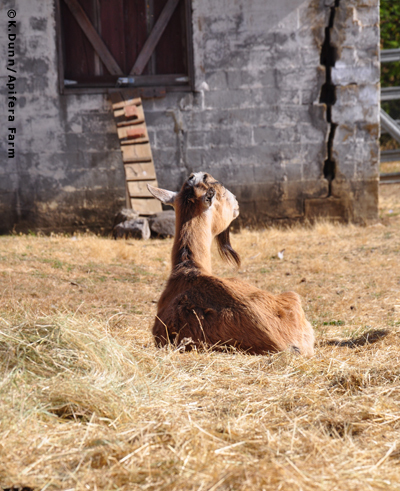 None of us knew how sick Giacomo was when we first met him, he is like any donkey, so stoic. I truly believe, he held his pain in through out is many ordeals of neglect and abuse, to save himself. And when he realized he was finally in a place where animals wouldn't bother him, or people wouldn't hurt him, he let go. Oh, he is missed! 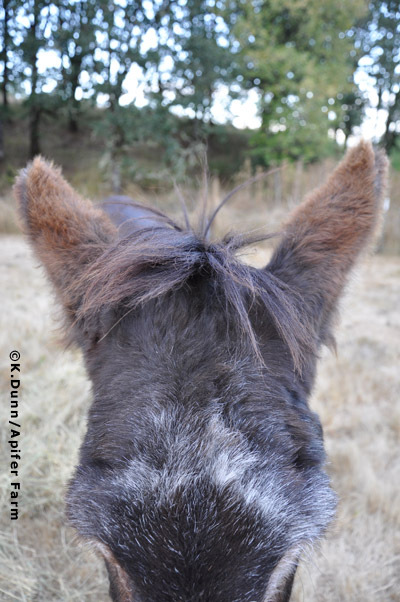 The most noble, the non replaceable old donkey of many names. My author's copy of the new book arrived yesterday. What can I say without sounding like an ego maniac - I love it, each page. Here's a little video that the puppets of Apifera helped me make, to inspire you to buy it...remember, it's not a book about puppets, but they insisted on being part of the sales team. 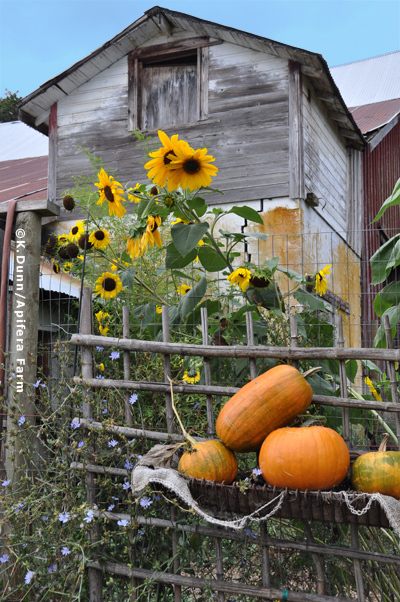 Stay tuned for more from Creative Illustration Workshop, like possible Flickr groups, and workshops here at the farm. Take time to notice something today, anything, that moves you, even for seconds. A juxtaposition of colors or textures. Old wood that has a history of footprints. The calling of a living creature that makes you turn your head. If you don't have chickens, what is the pattern of the car seat, or the shoes of the person on the subway? What does the hair on your hand look like up close? If you feel anything, incorporate that feeling into your day, through memory, writing or art. I've been spending quiet time alone with Jack, bonding, which we seem to have accomplished. He follows me around like a dog. He is a loner, but mainly because he can't kick out anymore, and isn't able to defend his food around the three minis, who I call the 'possee'. He has two special spots in the pasture he has claimed. He loves to have his head held. His ears remind of a brown bear so sometimes I called him Fuzz, or Buzz. But I've been calling him Giacomo. He's like many old men I've known- when you get to be this old, you've seen a lot of loss, and you accept it, but it starts to take its toll. "I care not for what happened yesterday, it was all fine, and tomorrow might be like today, or not, but I won't know until then, so I shall focus on this day, this moment, right now," thought Mr. Bradshaw. The print sale is still going one over at my main art site . So check it out if you haven't already. And, I've been cleaning out my overwhelmed storage drawers and spontaneously posting prints for sale on my Facebook Page . It's easier that way, so visit there often if you are interested in prints in the $50 and under range. I'll be posting one at a time, and as I find them lurking in piles. So scroll through the recent wall posts there, and keep watching. In which we find our typical morning hay klatch. It appears Apifera mimics the outside world. The old ladies out number the old men, goat wise that is, and poor Old Guinnias always attract company of the female persuasion. 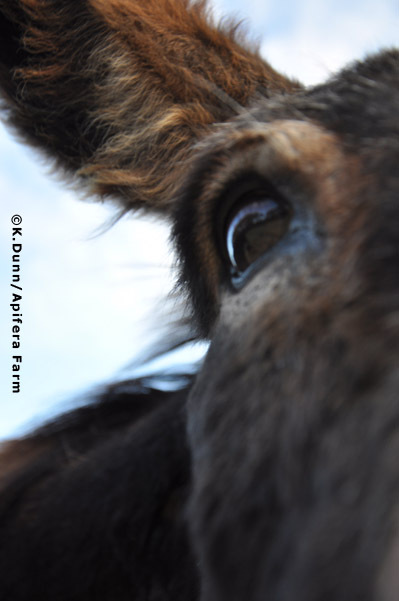 After residing at Apifera for a week, the old donkey has begun a morning routine. 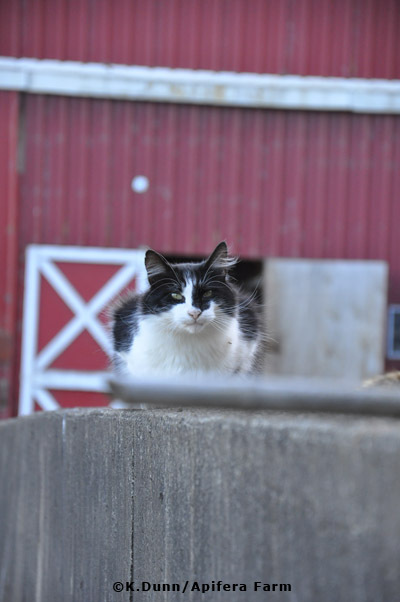 He starts out in the lower field, sunning, then wanders up to the barn when he hears me leave the house. He has taken to the cool, dusty floored enclosed area I call the "Clubhouse". 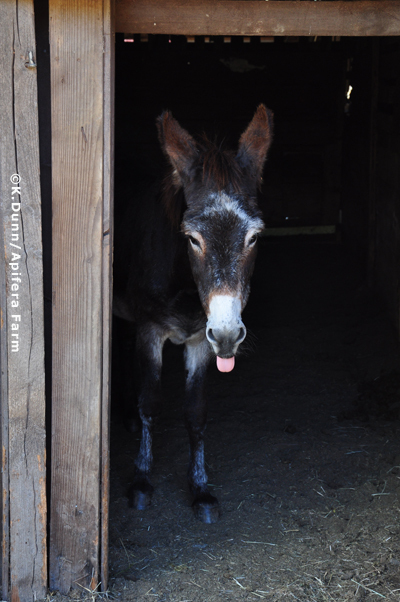 Only now the by laws of the Clubhouse have been rewritten with the following addendum: Donkeys entering Clubhouse must be at least 20 years of age. 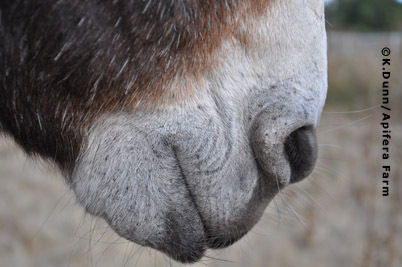 Younger donkeys must only stick their noses in. 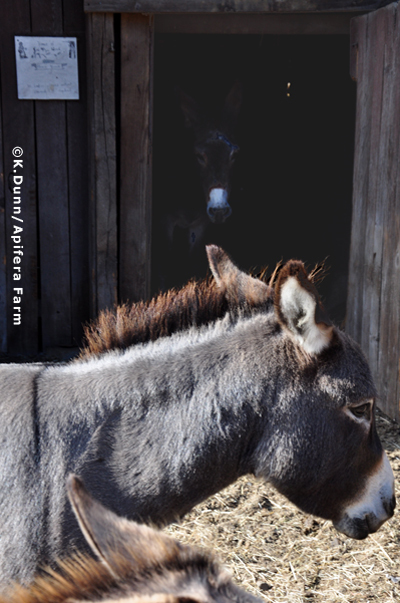 Shepherdess is allowed in if she presents ginger snaps to residing donkey. He sticks his tongue out after he drinks, however, he might have been sending Paco a message.